While the idea that one day soon we hope to pack up and head to Disney World for good is exhilarating, the actual waiting until that day can be downright depressing! We’re just not close enough to leaving to where we can do anything useful yet. But we have found a way to scratch the moving itch that is also of some value in our planning — virtual house hunting. Of course, we’re not actually looking for a house this far out. But through online searching we are starting to get an idea of what we want and where we want to be. Since this is also a fun outlet for us to satisfy our yearning to move, we don’t want it to be too much of a chore. So we’re not scouring local newspaper classified listings or scoping out real estate agent websites. We’re simply using the Trulia app. Trulia allows you to search house listings around the country and view maps and photos of available properties. And it’s been perfect for our needs at the moment. So keeping in mind we know little about the housing market in Orlando, or what the best neighborhoods are, or even much about traffic issues, here are a few things we’ve started to figure out during our searches about what we like and what we might want. Probably the number one priority we have is being close to the parks. For us that means anywhere within 30 minutes. Yes, being close enough to Magic Kingdom to see the fireworks would be amazing. But after catching this bug while living 10 hours away, I’m not going to be so limiting in our search! Obviously the closer the better, but I think 30 minutes is close enough that we would feel we could pick up and go on a moment’s notice. When we began looking at houses, we really didn’t have too much on our wish list since the main desire was just to be there. Now that we’ve started to see what we can get with our budget, we’ve definitely got a few specific items we’re looking for! I’m sure the list will grow as we get closer to potentially moving. But here are a few early things we’re looking at. The biggest thing we want is a house that will make us feel like we’re in Florida and on vacation everyday. So a palm tree or two would be nice! A bigger part of that feeling is a lanai. (For those who might not know, a lanai is at its most basic a screened in area outside of the house. See the example image below.) Enjoying the wonderful weather is one of the benefits of moving to Orlando. A lanai lets you do that in a bug-free, rain-free, and humidity-lessened way. Which means you can enjoy it more often. 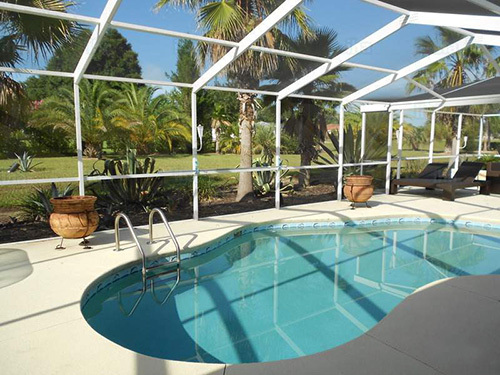 A lot of houses we’ve looked at also have pools under the lanai. I’m not a swimmer, but the rest of my family are. A pool is not a must-have for us. But admittedly, it would add to that vacation-everyday feeling — being able to sit under cover next to a pool on a beautiful day, sipping a cold Coca-Cola, while reading a book……. man, I’m ready to move now just thinking about it! Open living areas are popular these days — at least according to all the home improvement and real estate reality shows I’ve seen on TV. While not a deal breaker, I think it might be cool to have the living room, kitchen, and dining areas combined in one large area. We’re not big on entertaining, but with a move to Orlando I’ve heard we might start getting family members visiting much more often! My wife loves the water, so she’d be thrilled with a view of it from the lanai. Luckily lakes, rivers, ponds, and streams are plentiful in the region and we’ve seen a lot of houses in our budget that would fit the bill. One area we seem to be in disagreement on is the size of the house. She’s thinking smaller, a few bedrooms on a single story. I’m liking the houses with more bedrooms than we have people to fill them with! My thoughts? Right now our garage is crammed with stuff we want but don’t have room for. I think it’d be nice to have the space to spread out and enjoy ourselves. For example, the extra rooms could be used for crafts, gaming, or exercise equipment — things that are now stored in boxes or crammed in the corner of other rooms. Her argument is it’s just more rooms we’d have to decorate, fill, and then keep clean. Luckily we’ve got plenty of time to figure it out. We’ll have a lot more we want in a house as we get closer to actually moving. But these are the things we look for on Trulia as of now. Of course, there will be compromise. If we find a house we love just a stone’s throw from the park, we’d probably be OK with it not having everything we want. Conversely, the further we are from the parks, the more likely we’d want the house to have more of the amenities we want. This is the tough one to figure out from Tennessee! Looking at maps doesn’t help. Trulia gives us some hints. But without actually seeing these places it’s hard to judge. One of the things I look for when I read articles and blogs from other people that have made this move is what their thoughts are on the best places to live. Yes, we all have our individual likes and needs, but with nothing else to work on hearing what others did is at least a good starting place for us. So, again keeping in mind we don’t know what we’re talking about(! ), here are a few preliminary thoughts on what we’ve discovered in our early research. Windermere is the first name that always seems to come up. It’s just north of Magic Kingdom and is usually described as being “upper-class” or “the rich area”. While there may be enclaves of the upper-crust, there appears to be lots of places for us middle-class folks too. Another thing I often hear about Windermere is that it’s “older and more established”. 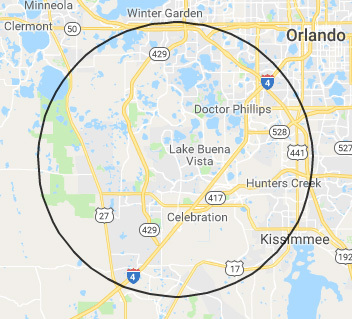 We’re definitely considering this location because of its proximity to the parks — it’s probably one of the closest areas you can get, especially for Magic Kingdom. However, we’ve noticed the houses in our budget here seem to be very plain, and not much different than the house we own here in Tennessee. Maybe part of that is because it’s an older area? It seems we’d be giving up that vacation-everyday feeling but in exchange be getting proximity. And, while I did say above we could compromise to be closer, I’m not sure I’d want to give up so much for it. But a contender, if we found the right place. North of Windermere is Winter Garden. We haven’t looked here much. It’s close to the edge of our comfort range, but I think parts of it could be workable. Need to do some more research here. East of the parks are Kissemmee and Orlando proper. We’re really leaning against these areas. There’s probably no avoiding traffic completely when you move to be closer to Disney. But the I-4 area and east seem to have the worst of it. South of the parks are Celebration and Davenport. While Celebration itself is probably outside our budget, we have seen a couple of houses nearby we could afford that were amazing — almost all our wish list items and proximity to Disney property. But they were gone quick. It would come down to luck whether something like that opened up during the window we would be looking to buy. Davenport seems interesting. Lots of houses in our budget. Almost all of them with the Florida vacation feel we want. And most within easy distance of the southern parks of Disney. I don’t know a lot about the area though. And there do seem to be a lot of short term rentals in this area. I’m not sure what the implications of living around those would be. Something else to look into! West of Disney is… I don’t know what it’s called! I do know that there may be potential here. A few years after we started going to Disney our GPS started taking us down 429 on the west side of the property, rather than the usual route down I-4. I was struck by how little traffic there was this way, and how beautiful the area seemed. There were a lot of residential areas over there and even before we seriously started discussing moving to Disney, I always thought this was probably a cool area to live in. But again, I know nothing about it — not even it’s name! More study needed, I guess! I’d love to hear any thoughts you have. Feel free to contact me with your input on houses, locations, neighborhoods, or anything else we’re not thinking of yet!